Turn your living room, office cubicle, or classroom into a winter wonderland by decorating with our Blue and Silver 2-Tone Metallic Snowflakes. When completely expanded, the snowflakes measure 11 1/2 inches and the 2-tone properties give it a sense of elegance. 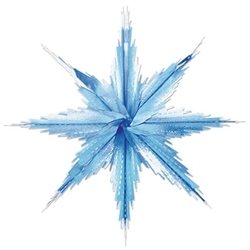 This is a popular snowflake decoration that will quickly become a yearly decoration for you when the winter months come around. Comes two (2) snowflakes per package.